I know everyone is hunkered down, trying to get out of town for the big holiday weekend, but if you have a moment in your busy schedule, please enjoy these three fine examples of Current Classics. A fine example of a Japanese-crafted lugged frame, a venerable Bridgestone design (with it's hallmark of extreme versatility) and a Trek from the classic period of US framebuilding. It was really hard to pick one to highlight, so I finally just tossed my three-headed dart (or was that a three-headed coin? Anyway...) and came up with Randy's Trek. Randy has three other bicycles in the Gallery (Randy's Trek 1500, Trek 600, Trek 660) - all Treks and none made from carbon. I've mentioned in more than a few posts and online commentary that the early Trek models are one of the bikes I've never had but always wanted to own. Good, simple, smart builds, with attention to detail that isn't obsessive. 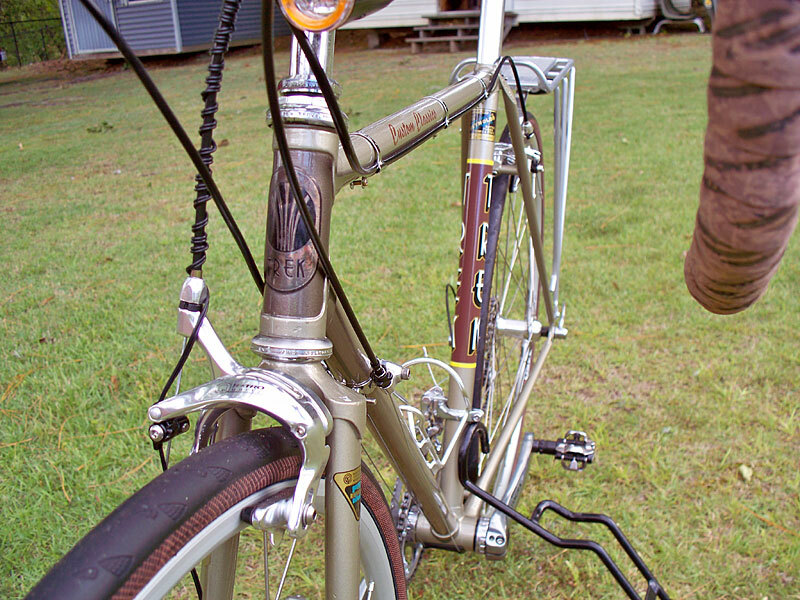 This one is from the "ideal" period and has a lot of the details which really make it prime in my mind: the "marquee" decal design (with the contrasting background wrapping around the tube), the externally routed rear derailleur cable (for a while they put it through the right chainstay), and the excellent clearances and braze-on's. A useful and versatile bicycle. Great to see it being enjoyed!